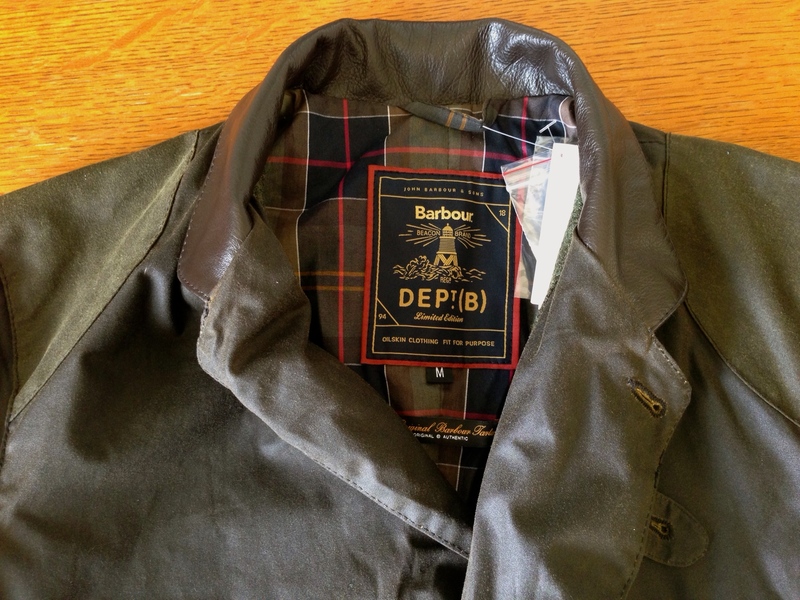 I made one of my major purchases for 2014 already, the Barbour Dept. B Commander Jacket. I’ve been looking for this for a few months now. This is a slim fitting casual jacket, which should be good to wear for rainy and mildly cold weather. Background: Barbour is an British company known for sturdy traditional waxed cotton jackets that stand up to rain and years of use. 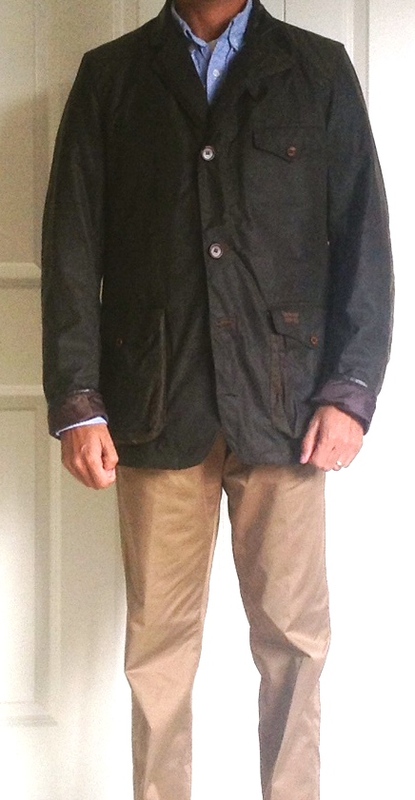 Most Barbour jackets are very roomy and made for layering, but lately they have been introducing some slimmer models. This particular jacket model is new for 2013. It is based on a very limited run of a Barbour x Tokihito Yoshida collaboration Beacon Heritage jacket, which is famous for being used in the Skyfall movie. It quickly sold out, then the similar-looking Dept B Commander jacket was made after the movie came out. It differs from the original model in that there is no attached hood and there is no storm flap inside the front jacket. It comes in the traditional olive color, but also there is a new color available now in navy. Material: The exterior is made of 6 oz Sylkoil, which is their formula of thornproof waxed cotton, and trimmed in leather at the collar and sleeves. The interior lining is made of 100% cotton and trimmed with 100% wool. There are patches at the shoulders, and elbows/forearms. The material actually feels waxy to the touch. Overall, it is medium weight. I would say good for 40-60 degrees, and maybe lower with more layering. Construction: The quality looks good. The buttons are nice, although there are a few hanging threads at the button holes. There are two large front bellowed pockets and one small left chest pocket. Two inner breast pockets. One large pouch in the back with zippers at both ends. However, no hand warming pockets. There are small hole vents at the armpits and bottom of the large front pockets. The collar can be closed up with an attached triangular piece of leather/waxed cotton at the neck, but I will generally leave the collar open. Next, I will discuss the fit and my overall impressions. Fit: This is tricky. This jacket is especially slim in the chest and shoulders. Some websites recommend sizing up. In an interview, the head of Barbour North America recommended using your usual size but be aware of the trim fit. After looking at the measurements, I decided to size up to a medium. I am 67.5 inches, 127 lbs, 36 inch chest, 31 inch waist. I usually wear a small in shirts and a 38S in slim suits. For the medium size, the shoulder measurements on different websites ranged from 17.5 inches to 17.75 inches. I actually measured the shoulders to be 17 inches. For the rest of the measurements: it measured 20 inches armpit to armpit, 29.5 inches length from bottom of collar, and 26.5 inches sleeve length from shoulder seam. On me, it fits pretty well in the shoulders. The chest is snug, and the armholes are very high, which makes it even more snug feeling. It could use some more tapering at the waist, but I want to leave room to add a sweater. The length seems fine. The sleeves are way too long. I rolled them up for the picture, but they will need to be shortened at least 2 inches. This is a pain because it will need to be shortened from the shoulders. I will need to send it in to Barbour to get this done, and it will be expensive. Value: This is not a great value purchase, even on sale. You are really paying extra for the design and name brand. The fit and design is quite unique. 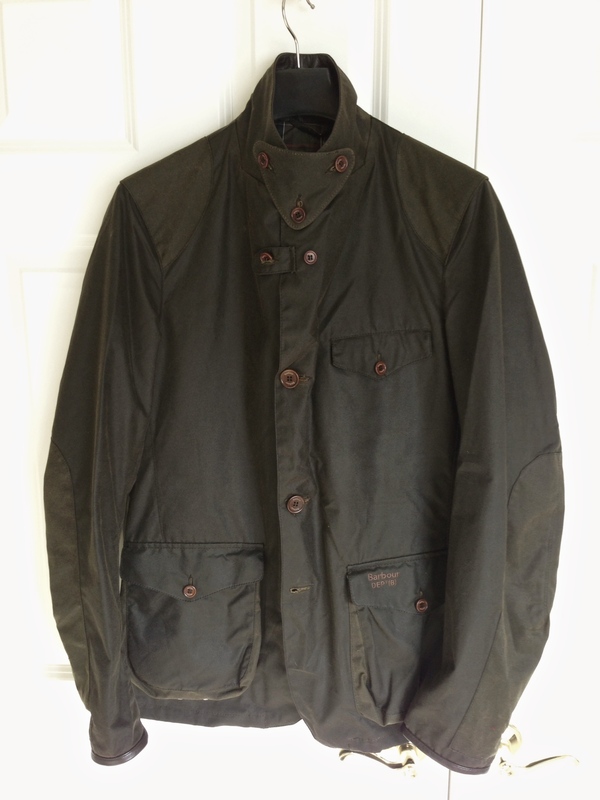 However you can get a somewhat similar Barbour jacket, such as the Ashby, for cheaper. This one, I got from Aspecto.co.uk, after hearing about their sale. I had never heard of them before. Their website ordering was easy and the shipping was prompt. Even with the sale, the price was $467.45 which included £32 for shipping. I also expect to get a bill later from Fed-Ex for customs. The usual price from END Clothing is $535.00 + customs. Haberdash had it on sale briefly in early December but I missed it. I believe JCrew was selling theirs for >$700 last year, and sold out. Overall Impression: I like the material and weight and construction of the jacket. The style is less casual than a fatigue jacket, but more casual than a cotton blazer. I think it could be quite versatile and useful in inclimate weather. I am going to keep it inside with the tags on for a few days, just to make sure I don’t want to return it. I will probably wear it mostly with the collar down, almost like a blazer style. It should go well with jeans/chinos and boots. The fit was slightly loose in the waist and WAY long in the sleeves, but the chest is about as good as it can get. Of course I don’t like the price, but I thought I might regret going for a cheaper Barbour after eyeing this one for so long. 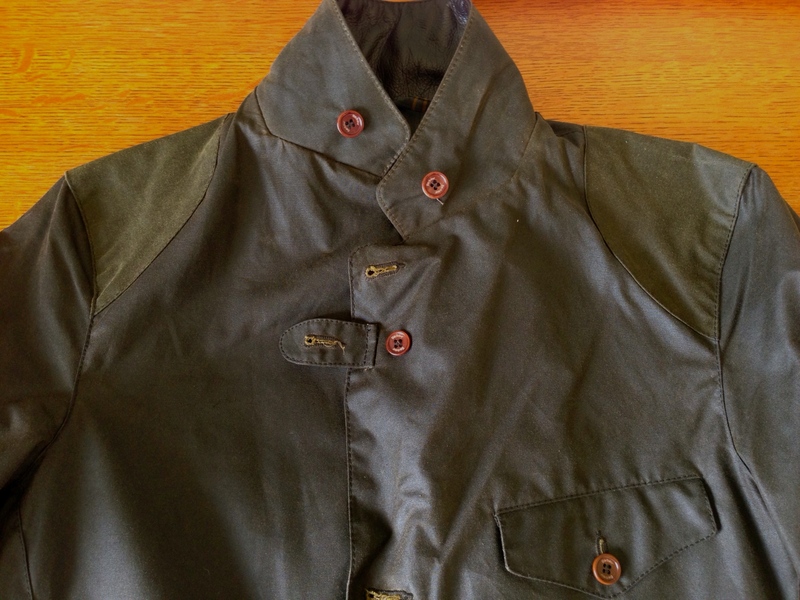 I would be interested in hearing comments from V. or anyone else who has a Barbour about how they like theirs. you have interesting sizings vs. your body size. i'm 5'10" 140-150 depending on the day with a 37" chest. i couldn't imagine sizing up on any barbour clothing (though i've never tried this particular jacket). a size small liddesdale looks like a size large jacket on me, and my size 36 bedale is pretty billowy. from your pics, i think i would definitely be interested in seeing how a small would look on you. i agree that barbour jackets are priced according to their brand name value. my barbours seem decently made though all had loose threads also. my own perceived value of the bedale is closer to $200, and a liddesdale ~$80. 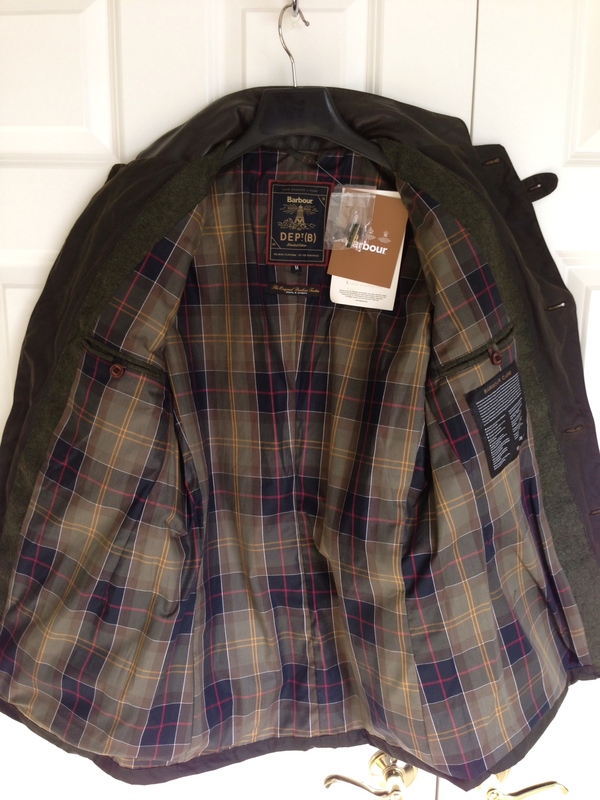 i don't see the worth of barbour jackets @ msrp. 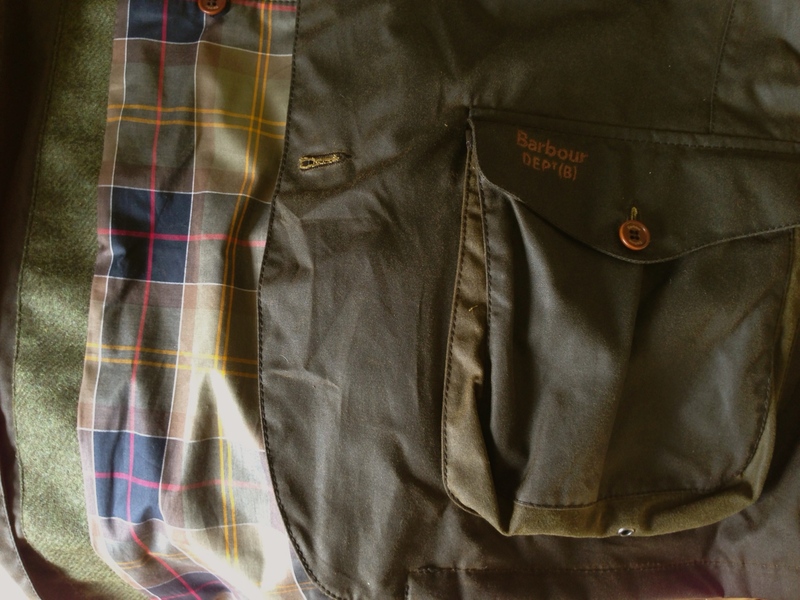 The Commander is part of Barbour's slim fit line. I was hesitant as well when the consensus was that for most Barbour jackets that their smaller sizes felt really huge. I also checked around for measurements and compared them to what I currently have, but I ended up sizing up as well. I usually wear a medium in pretty much everything, but I ordered a large because I read that the shoulders when lifting your arms could be a problem. The jacket is trim. The shoulder fit well and everything else fits well. I could have probably gotten a medium and been fine, but I don't necessarily want outerwear to fit really snug, especially if you're going to be layering underneath. The sleeves are long in comparison to how the jacket fits, but I have longer arms, so it actually fits pretty well. I have a Bedale I picked up from JCrew earlier this year and a LE canvas jacket I picked up last year at 1/3 of what the Bedale cost. Obviously I got both on sale. Honestly, the LE jacket stacks up very well against the Bedale and is the warmer of the 2 jackets. You are definitely paying some for the Barbour name. First, I really like the look of that jacket. I"ve tried to pull together my own using Otter Wax and an old military surplus but weeks later it still retains an oily/waxy feel that makes me uncomfortable wearing it. Interesting thoughts on a value of a barbour though. They are definitely expensive, and I haven't ever bit the bullet on one as much as I'd like it, but I've always thought of them as a once in a lifetime purchase. You should be able to wear it every winter for 30 or 40 years which puts the price in perspective, especially since it is a "timeless" style as much as I hate that word, and the proliferation on leggings clad Ivy League girls over the last 10 years. The question then is whether there is something else similar that offers better value for money? With this particular jacket, you are paying for the association with not only Barbour but Bond. I bought this jacket back in the fall (as self-congratulations on a promotion). I went with a Large. 6'1, 200lbs, 40r. Arms are tad long, but the rolled sleeve works. The fit is snug, but that's the point of this jacket imo as compared to a Beaufort or a Bedale. The jacket itself is awesome. Have gotten nothing but compliments on it. Nice jacket, and great review. I want one. I think it looks a little big on you, though. Do you think it would be suitable to wear this coat over a suit? Or is the fit too slim/short?